Ongoing glacier retreat changes local maps. For alpine tt can be the formation of new lakes due to glacier retreat, the draining of a lake that had been dammed and the expansion of lakes or fjords. In the case of Greenland’s glacier that are not confined by a fjord it can be the formation of new islands. This is no longer a rare occurrence. A close look at many areas along the west coast north of Disko Island reveals a number of new islands such as for Upernavik Glacier. Another location further north where new islands are being created is Kong Oscar Island. Box and Decker (2011) note that the retreat rate of the last decade has been 0.6 square kilometer per year. Howat and Eddy(2011) Examine 75 glacier termini in NW Greenland from 2000-2010 and find an average retreat of 127 meters per year and all but two are retreating. They further note that this contrasts to the retreat rate for the same area of 17-20 meters per year. 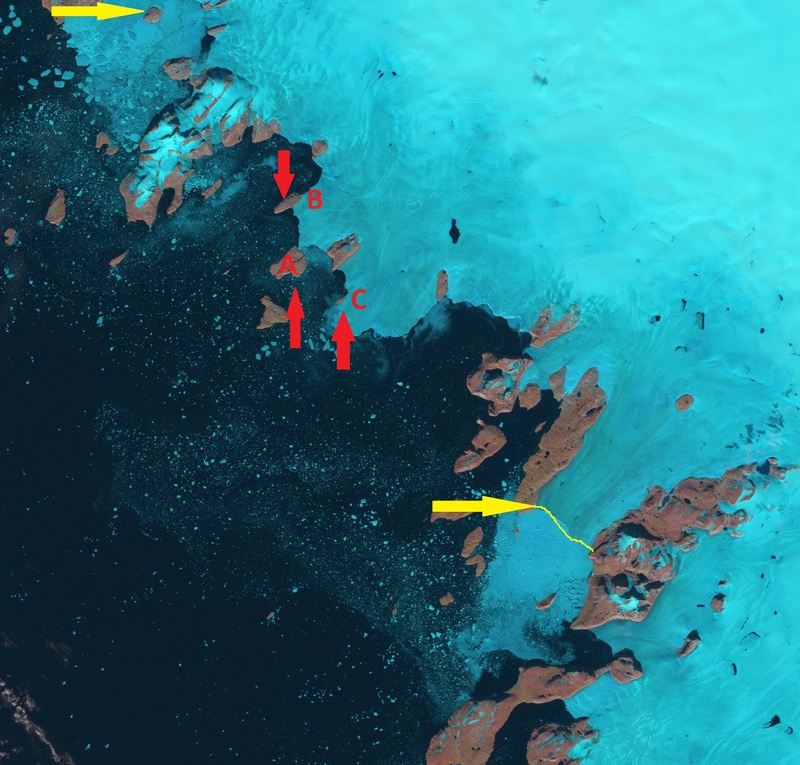 Landsat images for the Kong Oscar Glacier region from 2002, 2010 and 2011 are below. 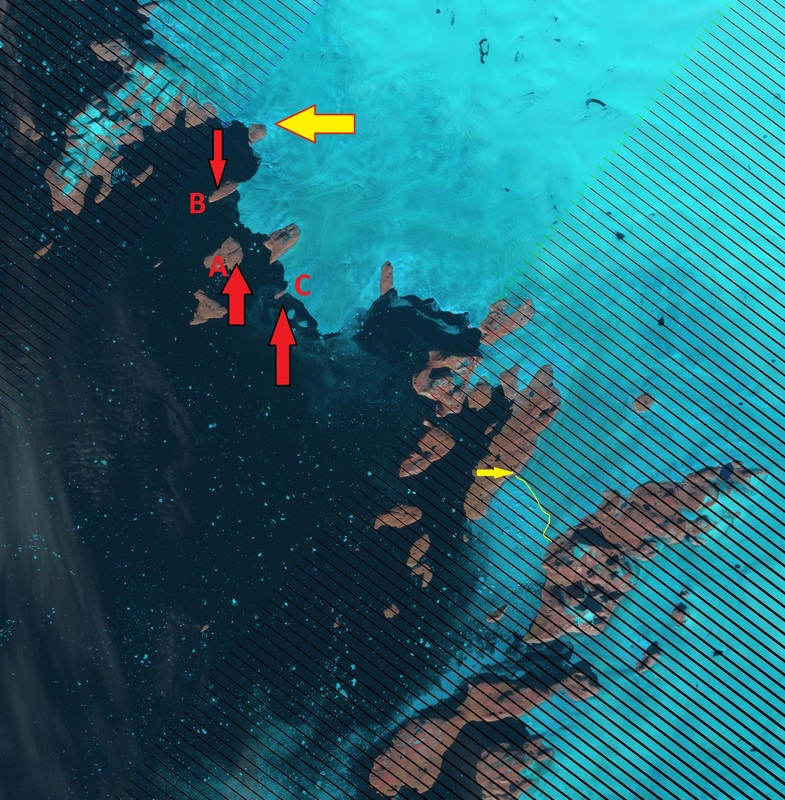 The terminus of the southern most terminus shown, Sverdrup Glacier, is outlined and is near the tip of an island in 2002 and by 2011 Sverdrup Glacier has retreated 4 kilometers in this eight year period, note yellow arrow. Three islands are examined all noted by red arrows and lettered A-C, these islands are all part of Nansen’s or Nordesnkiolds Glacier. 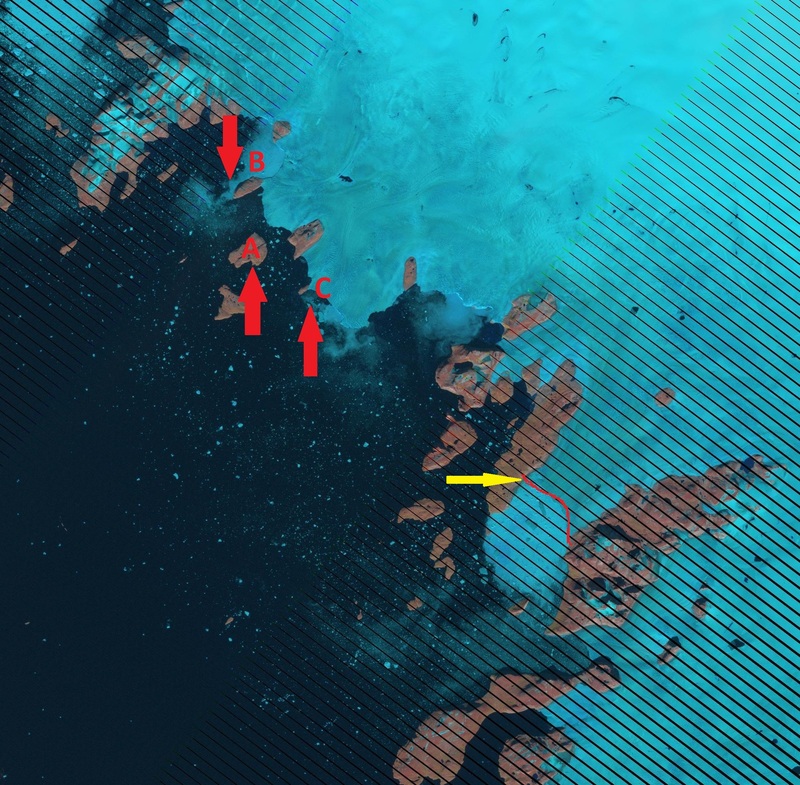 Island A was connected to the ice sheet in 2002 and now is separated by a deep water passage. Island B is just hanging on in 2011, compared to 2002 and even 2010. This connection will likely not survive next summer. The same can be said for Island C. . This glacier is not confined to a narrow front or a single terminus in a fjord. The rate of retreat may be less, but the overall area lost is not. We must note that there are many new islands being formed it is not just a single island somewhere, such as Warming Island.